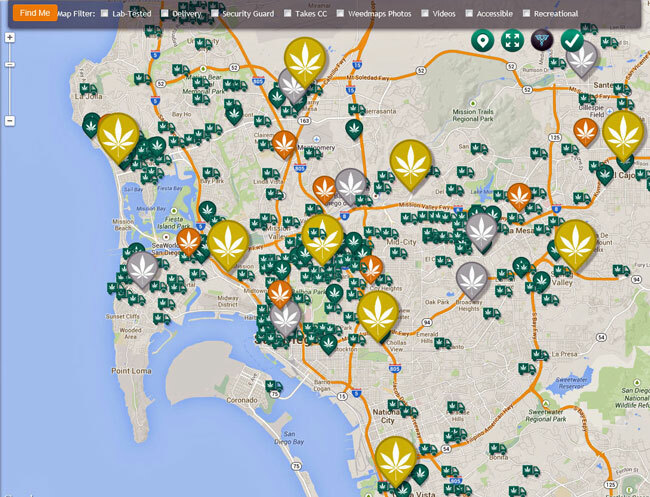 This screen capture from weedmaps.com shows stationary and mobile medicinal marijuana clinics in central San Diego. The City Council's Public Safety and Livable Neighborhoods Committee on Wednesday will discuss amending San Diego municipal code related to the possession of marijuana for medical purposes and the operations of medical marijuana cooperatives. There must be a whole lot of sick people downtown to justify the expense of this network of suppliers. Or, the whole thing is a farce to legalize the drug without regard for federal law. Odd there is so little reaction as we approach National Law Week 2014.